Boy 1st class J/28285, H.M.S. Formidable, Royal Navy, sunk by a U-boat in the English Channel. Died 1 January 1915 aged 17. Remembered on Chatham Naval Memorial. HMS Formidable was a battleship serving with the Royal Navy in the Channel. It had a crew of 780 men. On New Year’s Day, 1915, the fleet was returning from firing exercise. Six battleships and two cruisers were sailing in line through Lyme Bay . HMS Formidable developed engine trouble and was last in the line. Unknown to the navy the fleet was being shadowed by a German submarine. At 2.30am, in bright moonlight, HMS Formidable was torpedoed. Nearly 600 men were drowned or died of cold in the freezing waters. Born in Leigh , Kent on the 31st January 1898. 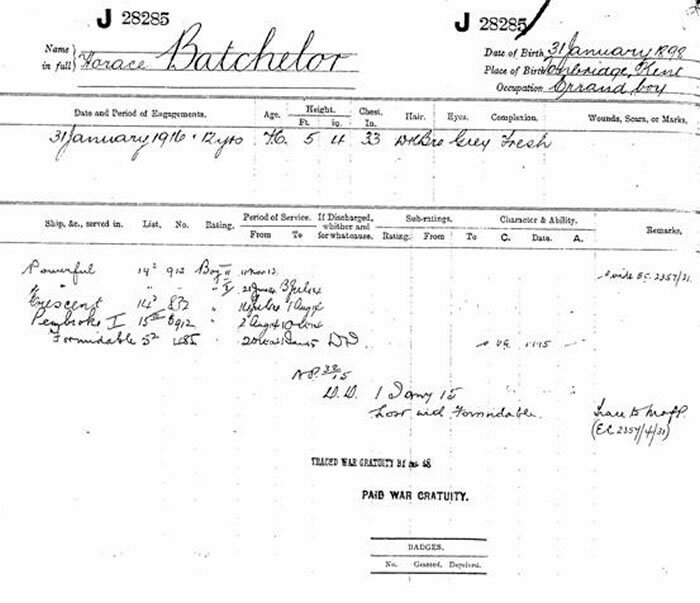 Baptised on the 1st May 1898 Son of Alfred and Esther Batchelor of 20 Powdermills, Leigh.